Date and place of birth: 16 January 1896 at East Preston, Sussex. Date and place of death: 11 July 1916 (aged 20) at St. Omer, France. Archibald Parker was the son of a railway platelayer who moved to West Lavington from the Littlehampton area in the 1890s. Archibald John Parker was born in the district of East Preston, near Littlehampton on 16 January 1896. He was the son of George Parker (1865–1905) a railway platelayer and his wife Beatrice née Butcher (1874–1967) who married in East Preston in 1892. By 1901 the family had settled at Royal Oak Cottages, West Lavington and had five children of whom Archibald was the third. The children attended West Lavington School and Archibald’s elder brother Sidney is listed in the punishment book as having received several slaps on the hand for disobedience! In 1905 George Parker died leaving the family fatherless. In the next glimpse we catch of the household in the 1911 Census, Beatrice Parker is listed as the head of the family. She is stated to have been married for twelve and a half years (i.e. the duration of the marriage until George’s death) and to have had eight children of whom seven were still alive. Four of the children were listed as living with her including Archibald who is described as an errand boy aged 15. His elder sister Hannah is lodging next door. Documents held by the Commonwealth War Graves Commission indicate that his mother later moved to 6 Carron Lane, Midhurst. The date of Archibald’s enlistment is not known but he originally enlisted in Midhurst, joining the Royal Sussex Regiment. At some stage he was transferred to the Royal Warwickshire Regiment and his unit landed in France at the end of May 1916. The 2nd/6th Battalion of the Regiment were originally second line battalions i.e. not intended for service overseas, and formed part of the 61st (South Midland) Division. By 28 May, they took up positions in the area of Merville – Gonnehem – Busnes – Thiennes which is north of Béthune. It was while fighting with the Royal Warwickshires that he incurred the wounds from which he died at the age of 20. The date of his death is given as 11 July 1916 at St. Omer in northern France. 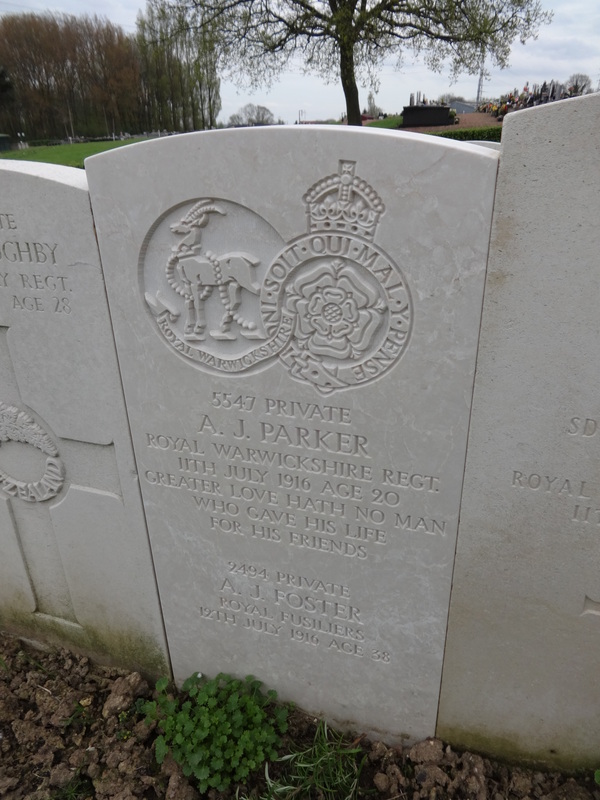 Archibald Parker is buried in the Longuenesse (St. Omer) Souvenir Cemetery and commemorated on the West Lavington war memorial. His grave bears the epitaph “Greater love hath no man who gave his life for his friends”. His grave is shared with Private Arthur Foster of the Royal Fusiliers who was killed on the following day. Private Foster originated from Lancashire but was living in Cornwall before the war.